Volunteers have helped transform school grounds at the Heaton School to improve the learning environment for students. Heaton School in Heaton Moor is Stockport’s Secondary Special School for young people with severe learning difficulties, profound and multiple learning difficulties, autism and complex medical needs. The school caters for students aged 11 – 19 years. 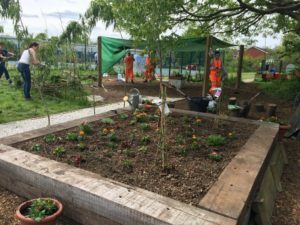 The school has been working hard over recent years in collaboration with The Rotary Club of Stockport Lamplighter to ‘rewild’ an area of the school field to help the school become a Forest School. Forest School is an approach to teaching and learning that allows all students develop a wide range of skills and to improve their self-confidence and self-esteem through hands on experiences in natural environments with trees. The volunteers from the Buckingham Group, McGinley, Network Rail and East-Tec Electrical Services helped to take the project onto the next stage, by donating their time and materials. The volunteers enlarged the ‘firepit’ area in the grounds and created a path to improve access to the wild area and also installed new lighting to the garden area. Headteacher at the Heaton School, Jo Chambers-Shirley said: “For medical, physical and sometimes emotional reasons, many of our students miss out on accessing wilderness areas. To have an area on site accessible and available for our students to enjoy therefore greatly enriches their lives.